For Goodness Cakes is a home-based business located in the Cotswold neighborhood of Charlotte, just ten minutes southeast of Uptown and ten minutes north of Southpark. Address and directions will be sent upon request. Haines can be reached by phone when she’s not out playing with her kids or elbows deep in cake batter. Email is always preferred since order details can easily be saved and reviewed later. The phone number provided is a cell phone but please DO NOT TEXT your cake order. Your text can more easily get missed and forgotten. Call if you need immediate assistance. When emailing, please provide as many details as possible and be sure to always include the date of your event and your last name in the subject line. When inquiring about a wedding cake, please also include location and approximate size so that our availability can easily be determined. Please note that due to the nature of this business, emails sent on Thursday through Saturday may take longer to reply to. Thank you for your patience! If you would like to receive information about our promotions, classes, and events, please sign up to be on the mailing list by clicking HERE (and be sure to add info@forgoodnesscakescharlotte.com to your address book!). 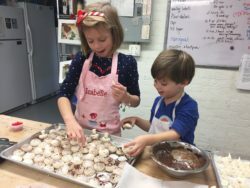 Haines’s favorite little helpers in The Bakement, making meringue mushrooms.